To excel in art, one must be patient. Skill takes time to develop. Work can not be rushed. One artist that exemplified patience was Georges Seurat. His style of pointillism (applying small dots of color) took an incredible amount of time. The scale & style of his most famous work ,Sunday Afternoon on the Island of La Grande Jatte, required the artist two years of his life to complete. So many of us have a hard time waiting 3 minutes for a bag of microwave popcorn to pop! Seurat had a vision. 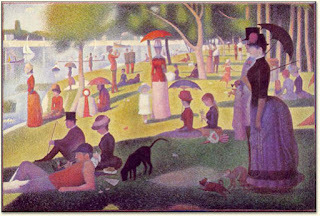 Seurat had determination. Seurat had a plan. Many Christians are lacking some of the basic life "skills" God has called us to have. We lack compassion, our kindness depends on our mood, humility is a bad word, gentleness is for the weak, and patience....who's got time for that?!? Yet these skills are important enough to be mentioned in scripture as something we're suppose to cover ourselves in. I could probably do a whole series on this verse, and each of the attributes mentioned. However, I want to focus on patience. Patience is truly something the world is lacking. We want everything NOW! We don't have time for patience. We don't have patience in our own skill development...so we make ourselves sound better than we are, we don't have patience to climb the ladder of success...we want to bounce on up to the top, we don't have patience for others in our life to grow & mature...we want them where we need them to be now. This is not the life God has called us to live. Patience should permeate ever aspect of our life: our relationship with God, His people, our job, family, friendships, daily interactions...EVERYTHING. They say you shouldn't pray for patience because God will give you something to be patient about. I feel patience is more of something you develop in the every day, and then when you are faced with something that TRULY requires patience...you are ready. We need to be patient with ourselves. Sometimes we want to be somewhere we just aren't. We have to be ok with where we are, but trust God with where He wants to take us. Like Seurat, we need to have a vision, determination, and a plan. If those things are in place...patience will be a tool in our development and not a trial. Dear Lord, Help me to grow in patience. Allow me to see the need to develop this area of my life as I grow deeper in my relationship with You. May patience be a witness to others of your impact in my life. Patience is a virtue. Virtues are often forgotten. Well said. As an art teacher in a Christian school I am always looking for new ways to tie art and and following Christ together in an art lesson. Thanks for your blog, I love your devotionals.